In the last three months, a handful of my friends have lost a parent, another close relative, or friend. I’ve spent the past week making arrangements for a dear relative with just a few months to live. My morning jog usually clears my mind and rejuvenates me, but this past week I’ve found myself breaking down in tears even as the sharp morning light and cool air wakes me from the nights of sleeplessness. Grieving our loved ones is a natural process and how we grieve is bound by culture, our relationship to the individual and how they passed. The grieving process can last a few months to a year, but most severe symptoms tend to dissipate after 6-12 months. In the process we may feel shock, tremendous sadness, anger, emptiness, depression, anxiety, etc. My dear relative has survived cancer 3 times so I had plenty of warning that his health was declining, yet I found myself exhausted physically and emotionally. Kubler-Ross describes the normal grieving process as including five stages – denial, anger, bargaining, depression, and eventually acceptance. However, when progression through these stages is blocked or disturbed, symptoms can last much longer. A prolonged and disruptive grief is called Complicated Grief. People at high risk for complicate grief include those very close to the deceased; those who have a highly dependent or complicated relationship with the deceased; when the death was sudden; those experiencing multiple losses; those who lack social support; those with a history of mental illness and/or substance abuse; those with multiple concurrent stressful events; and those who do not have traditions for mourning and grieving. Grief Therapy is usually time-limited and focuses on helping the individual accept the reality of the loss; work through emotional pain; adapt to a new life stage without the person who passed; establish a new relationship with the deceased through memories and legacy of the deceased; and reengaging in life. A recent article in the New York Times by Jane Brody talks more extensively about the symptoms, causes, and treatments for Complicated Grief. "The greatest human skill you can have is to take love in, and metabolize it, that's how you grow." 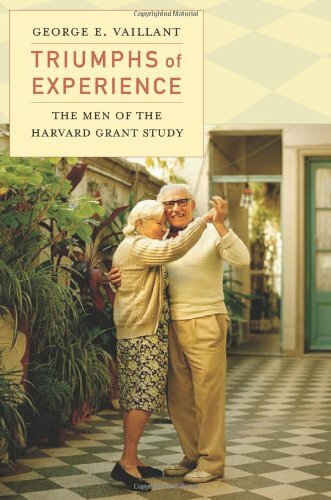 Harvard psychiatrist George Valliant succinctly describes one of the surprising findings in his study of factors that drive happiness in men. Very interesting findings. Listen to an interview with Dr. Valliant and read more about the study findings here. What can I do to help a friend who is suicidal? Listen and watch for sign of hopelessness – it is one of the clearest indicators of someone who is considering harming themselves. Listen well – it’s hard to watch someone we are close to go through tremendous pain, and sometimes even harder to keep ourselves from jumping in and trying to problem-solve. This can be a mistake. What someone needs most in that moment is someone to listen to them and to hold them emotionally. Provide “self-care” – people going through severe depression often isolate themselves and do not have the energy to care for themselves. Do the “self-care” for them. Make a date to go for a walk together. Bring them a home-cooked meal. Take care of arrangements that would get them on their feet, etc. Lastly, in this age of texts, Facebook, and far-too-busy lives, there’s no substitute for a direct connection when someone is suffering deeply. Pick up the phone and call. Meet up for coffee. Visit for a weekend. What have you done that has been helpful to someone? What has someone done for you to get you through a tough time? Here are some local resources that may be helpful if you have questions about what to do if you suspect someone is suicidal and resources/hotlines to provide them. I will be posting regularly on topics related to self-care, overcoming depression, managing anxiety, and other areas focused on living a healthy emotional life. I invite you to contribute your ideas and thoughts.